If I know one thing about my readers, it’s that they like walking down Memory Lane now and then. After two days of preaching about punctuation, let’s take a walk, shall we? I’ve been sick for about a week with a debilitating sinus infection. If you’ve ever had one, you know it can cripple your brain and cloud your thinking. In fact, I think this one has cut off some neural pathways altogether and opened up some that have been dormant for decades. 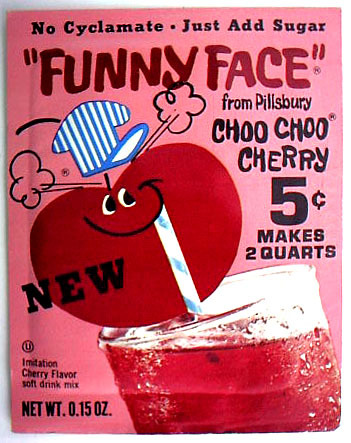 Out of the blue yesterday, while struggling to remember something important, I remembered Funny Face instant flavored drink mix. Who remembers Funny Face? To put in perspective how long ago it was on the market, the label brags about the drink being free of Cyclamate, an artificial sweetener that was banned around 1970 for causing cancer in rats. I recall at the time, imagining a rat drinking Funny Face through a tiny straw. The makers of Funny Face were ahead of their time in giving the various flavors way-out names. In fact, some were later changed, likely for their political incorrectness. My friends and I assigned flavors to each other. Sadly, I was Freckle Face Strawberry. I guess that was better than Goofy Grape or Loud-Mouth Lime. Other flavors included Lefty Lemonade, Rootin’ Tootin’ Raspberry, Chinese Cherry (later renamed Choo-Choo Cherry), Injun Orange (later renamed Jolly Olly Orange), Captain Black Cherry, Rah! Rah! Root Beer, Pistol Pink Lemonade (huh? ), Rudy Tutti Frutti and With-It Watermelon. Just remembering the carefree days of Funny Face relieved my sinus pressure, at least temporarily. What flavors from your childhood would you give your eye teeth to taste just once more? Funny, especially for someone to whom all of the products are unknown. Never had them in the UK. In keeping with the blogging, should it be Memory Lane (capitalized)? But recalling childhood pleasure should ease pressure. I think back to ads, remembering drinks in England like Tizer (the appetizer) and R White’s lemonade (‘I’m a secret lemonade drinker’ went the jingle as a man crept to his fridge in the night). You can do the Google searches. OK…Ovaltine, the old Ovaltine, not the modern re-invented product. It is just a matter of time before you do a Slurpee blog. We all have Slurpee memories…mine go back over 40 years. As kids, we would freeze Kool Aid in ice trays…great stuff! Now we freeze Jello – with a kick! Banana Laffy Taffy – which is making a comeback – Willy Wonka has it now. Those little wax coke bottles – what was their name? Lik-n-aid??? Something like that – ohhh I loved those! But my favorite from childhood was Cadbury chocolate bars. They were not sold here then and only came in care packages from my granddad in England. Such a special treat! Yea…we would chew the wax drink bottles. Wow, I just noticed the unnecessary quotation marks around “Funny Face” on the package. Oh well, it was the sixties. Remember red wax lips. First you put them on and looked like Angelina Jolie and then you chewed the heck out of them. Ahhh… the miraculous internet grants your wish every time! My father still buys those orange circus peanuts. I think those and cockroaches will outlast us for centuries, and yet I usually eat one. Does anyone remember Fizzies? You dropped them in a glass of water, they fizzed for about a minute, and they were supposed to mimic the taste of Kool-Aid. They would change the color of the water, but they tasted awful. Fizzies weren’t that bad. They were really Alka Seltzer with fruit flavors. How about Lotta Colas? I think they might have been 16 oz. I went looking for Maypo during the February snow and the clerk had no idea what I was talking about. How in the world could you remember all of that about Funny Face? Do you remember fizzies? Gus, we’re in luck. My cousin showed me that we can buy 12 boxes of Maypo on Amazon for $34. Shall we go in? I know what it’s like for a store clerk to look at you as if you have three heads. I am betting it’s the same Giant where the clerk didn’t know what paper doilies were. Imagine! Or at The Container Store, when I asked for a peck basket. When another clerk heard the frustration in my voice, she came over and said she knew exactly what a peck was and then proceeded to sing “I love you, a bushel and a peck and a hug around the neck.” But I digress. Re: sinus infection. Have you heard of — or better yet — used a neti pot. Look it up online or on Dr. Oz’s website. Easy, inexpensive, and beneficial! Wow, you are the second person today to recommend one. I have heard about them, all good, but haven’t tried. I have had sinus problems all my life, including two surgeries. I prefer natural therapies – and think a neti pot makes a great deal of sense. Thanks! My allergist recommended the Neilmed Sinus rinse and I think it is a little easier to use then the Neti pot…..and it really works. Always wondered why my sinuses cleared up after a few dunks in the ocean (like last week). I did not remember the Funny Face drinks until you mentioned the flavors and the memories rushed back. My favorite sweet treat was a Heath Bar. I love anything with toffee. However, all of the neighborhood flocked to our house to eat hohos. Here’s the important question: did you peel and unroll your Ho Hos first or bite into them undisturbed? I second this sinus remedy! Neti pot is cumbersome, this is fabulous. You can find it at any drug store now. I also relish what Pixie Stix did to the color of your tongue. I remember that Captain Kangaroo advertised Tastykakes on his show and he was from Philly. I still love Pixie Stix; don’t tell anyone. No Maypo for me, I was a CoCo Wheats girl!